The EU has pencilled in April Fools’ Day 2020 as a leading option for Britain’s first day outside the bloc, should the UK government ask Brussels for a lengthy extension of article 50 in three weeks’ time, it can be revealed. The date was to be offered at the leaders’ summit last week if Theresa May had followed through on her promise to request a short extension in the event of passing her Brexit deal, and a longer one should it be rejected again by the House of Commons. Such was the disapproval of her cabinet, the prime minister only sought a short delay until 30 June in her formal letter. She was subsequently given an unconditional extension until 12 April, or a longer one to 22 May in the unlikely event of the withdrawal agreement being ratified this week. Without having received a request from Downing Street for a prolonged extension, the EU’s leaders instead left open the offer of a lengthy delay should there be a new political process or event before 12 April, such as a general election or second referendum, but they did not stipulate its potential length. 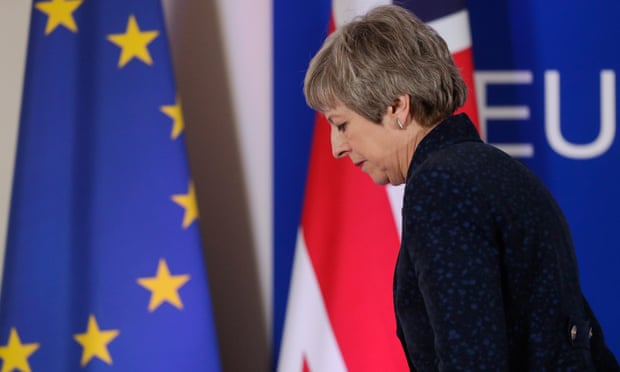 A one-year extension, ending on 31 March 2020, was, however, written into internal EU papers before the summit as an offer that could be made to May should she formally seek a longer extension, sources said. It will likely remain an option if May comes back to Brussels having failed to ratify her deal. Such a UK departure date would ensure the British government would not have any opportunity to meddle in the EU’s long-term plans, including its budget, sources suggested. Sources emphasised that no decision had been made and it would be the subject of intense debate among the leaders at a summit, likely to be held on 10 April in Brussels, should May come back again for extra time. The new timelime emerged as Guy Verhofstadt hailed Saturday’s Put it to the People march in London and a petition with more than 5m signatures calling for article 50 to be revoked. The European parliament’s lead Brexit negotiator said he was very pleased MPs had voted to take control of Brexit from the government. “We see at the moment a real Brexit revolt,” he said. “Until now, all the Commons votes have been against something. This is the first time that there is a vote for something – cross-party cooperation. We have long called for that. Philippe Lamberts, an MEP on the parliament’s Brexit steering group and a co-leader of Green MEPs, offered a damning analysis of May’s leadership. “Theresa May might be tempted to play [a] scorched-earth policy and say: ‘Whatever parliament wants, I won’t do it,’” he said. Lamberts added that May had even managed to upset Luxembourg’s prime minister, Xavier Bettel, whom he described as “Mr Nice Guy”, suggesting the British prime minister “must be totally devoid of the basic human skills you need to be a political leader”.